There’s been a growing awareness about the effects of gluten, a protein found in grains like wheat, rye and sometimes oats, on certain people. An estimated 1 in 133 Americans have Celiac Disease (CD), a gluten-related disorder that causes the body’s immune system to work against itself. And if you have CD, you could eventually face dental problems like enamel pitting and erosion. When a person with CD consumes gluten, their immune system mistakenly identifies the protein as malicious and attacks it. The attack occurs in the membranes that line the digestive system, which in the process destroys cilia, tiny hair-like structures that aid in food absorption. This disrupts the body’s normal absorption of nutrients, which can lead to a number of systemic conditions including intestinal cancer. Because of the lack of nutrients, your teeth’s enamel may develop defects. You may begin to see dull spots or pitting, or chalky grooves in its normally shiny surface: this is a sign you’ve lost surface enamel crystals (decalcification). You may also be more susceptible to outbreaks of aphthous ulcers (canker sores). Because symptoms can be misdiagnosed or go unnoticed, it may be years before you know you have CD. You can, however, get a definitive diagnosis through a blood test for gluten antibodies, which is then confirmed with a biopsy of a tissue specimen from the intestine. While there’s ongoing research for CD-related medication, there’s currently only one recognized treatment for it — remove gluten from your diet. This is much harder than it sounds, and requires knowing what you can and can’t eat, along with strict monitoring of food package labeling. Thankfully, the world is becoming better educated in this respect as more food manufacturers are clearly labeling products containing gluten and restaurants are providing gluten-free menu options. 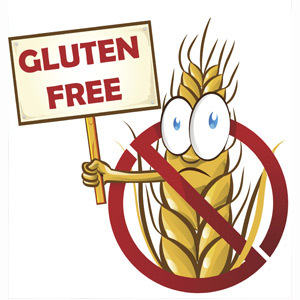 Once you have dietary controls in place, your dental issues can be treated as any other person, with one exception: none of the products used in treatment like polishing paste or fluoride gels should contain gluten, and must be verified before using. CD is a serious condition that could even become life-threatening. Knowing you or someone in your family has it will help you protect both your overall health and your teeth.